Glenn Manton is a Carlton Football Club life member having played over 150 games for the Blues. With an AFL premiership medallion and numerous finals appearances to boot Glenn's time at Carlton was marked by his presence in a dominant backline and off field high-jinx on Channel Nines Footy Show. A dedicated family man Glenn is also known as a philanthropist, media performer, author, athlete and now the respondant to any and all burning questions from Blueseum visitors. From the serious to the not so serious footy related question (mostly Carlton please) e-mail Glenn at the Blueseum and he will answer them for you in a serious or not so serious way. 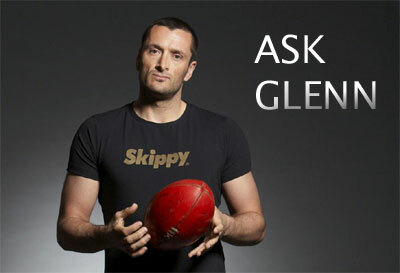 Please CLICK HERE to send your questions to Glenn. My Comedy Festival character from The Spray is based on the more negative aspects of AFL coaching which through their sheer stupity offer the best material for a comedy routine.It is of no shock to those who have played AFL football that such comments and actions are made but to Joe Public the realization that certain coaches/assistants are nothing more than smoke and mirrors with respect to ability and ordinary people in general comes as quite a shock. For the record it should be noted that David Parkin-aside form bulging jugular-and Kevin Sheedy-aside from alternative thinking-provided very little (if any) material for The Spray. Glenn thanks for doing this for us. It is my pleasure to share some of my thoughts with you and I thank all users of the Blueseum and Carlton supporters in general for taking the time to ask their questions.At the age of 15 I went to Essendon as a CHF having kicked around 75 goals in the under 16's in 12 games for East Kelior...Kevin Sheedy took one look at me and said 'you'll make a great full back'..I couldn't believe it! During my Under 19's and reserve grade career at Essendon I played on a half back flank which was my most natural position before playing senior football in any number of positions thus gaining a reputation as a 'swing-man' if you like.The truth was that I never settled into any one position with the Bombers playing one good game and then one average game as a rule. Moving to Carlton I found myself,thanks to Andrew McKay's academic pursuits, with a place in the backline and until '98 on the halfback flank which was highly desirable.In '98 however I was asked to play on the likes of Modra-White-Lloyd-Everitt etc to free up Silvagni and co and as a result of those performances found myself playing in key positions for the next 6 seasons! I knew I should have said no! In terms of going forward it was always a great chance to play a 'free style' game without the direct pressure-if only it happen more often! To simply write a handful of words in response to this question and accurately portray life after football is simply not possible thus I apologize in advance if this 'answer' lacks the depth you were seeking.There are days when you question why you wanted to play professional sports as you deal with lingering injuries-stereotypes-disrespect (often felt after you initially finish your career)-age-life changes-shifts in confidence-life in general...with each and every player dealing with such varied issues to different degrees and in various ways. There is no mistaking however that playing a 'sport' for a living and being able to perform in front of thousands of people is an incredible gift that reflects hard work-timing-commitment and luck...I would not change the journey as such but with the beauty of hindsight I would have chosen some different roads.I will always 'play' sport and as such maintain my health/fitness and where possible encourage those who share sporting aspirations to ascend to their utmost. Congrats on a Great Carlton Career. You were one of my favorites, and i love the way you wore your heart on your sleeve. Apart from the 95 flag, what are some of your fondest moments while playing in the Navy blue? I took great joy watching you kick the opening goal of the 99 Prelim. Many thanks for the compliments as they are always highly appreciated. Without going into long winded details I would suggest that each game I played where by I could take the ground with one or more of my children was a great highlight-embracing my father after a great win at Optus Oval in the stand was particularly emotional given his level of health at the time-having opposition supporters threaten me with 'magnets' again at Optus Oval was a very amusing-'You won't be able to leave the goal square' they continuously shouted-feeling the disappointment at Optus Oval when Princess Di was pronounced deceased-standing in disbelief when the scoreboard caught on fire at the MCG-dealing with numerous and attractive 'streakers' at Subiaco and winning so many games by less than a kick out West in general and finally laughing internally when Mark Mercuri with whom I played junior football against/with and then at Essendon missed the open goal (I would never have thought he would miss and laughed out of amazement)during the dying moments of the '99 Prelim (as mentioned) capped off what was one of the most amazing games of football I ever played in.There are more-many and varied games with almost every game offering some type of story-those memories where particularly special/different. I would think that my role in the 1995 team was that of short term Mr Fix-it or point of difference. The team didn't have great flexibility across the board with most players being fairly specialized and the team owning a high level of stability.At that point of my career I had not earn't a particular position having played across the board for Essendon prior to my departure. With my addition to the forward line-for example-in '95 meant I would recieve the fourth of fifth best defender thus creating opportunities and likewise down back where I could gamble off my man as I was not required to play on the top line forwards.Essentially though I worked hard to ensure I made the team and was privilaged to do so. My memories of that particular game are rather self centered having left Essendon where I asked to wear number 22 only to be given number 25 (which was not a negative and part of an admirable Kevin Sheedy tradition of trying to match past players with their more modern versions-I would have thought I was more Billy Duckworth than Roger Merrett though!) Finding myself at Carlton rather unexpectedly I was presented-by chance-with number 22 and wore it in Round 12 for my first game for Carlton on the 22nd of June-having just turned 22 and of course the game being my 22! Yes I am supersitious!! Sports people are easy targets for those who wish to 'push' an idea involving money and without good support networks and astute management many athletes are taken advantage of during and post career. NBA basketballer Scottie Pippen from reports I have heard has little money to show for his stellar career after investing heavily in aircraft. Ultimately players are responsible for their decisions and must live by them. Any player who does not surround him (or her depending on sport) with worthy advisors is foolish as is the player who doesn't complete studies or trade and look to begin their post sporting life whilst they are playing. Everyone must constantly work towards new and improved goals regardless of their background-I have no idea of statistics but I would estimate but 1% of 'all' people simply falling into success. It was obvious from the moment that I walked into the CFC in 1995 that something was cooking. Like any and all players that year and beyond all I wanted to do initially was sit at the table. Having achieved that I began to look more closely at the menu and knew that dessert would be very sweet-in short I didn't want to be asked to leave the table for the sake of bad manners. Sure enough dessert was as advertised-pity we didn't feast again in 1996-maybe we had lost some of the hunger of the previous year? The short answer is that a mixture of mis-guided short term goals-violence and ego bought about the injury in question to my right elbow. I was told that I would never turn the knob of a door again and that 'sports' was certainly out of the question. The 'arm incident' will forever be a turning point in my life that taught me an enormous amount about my person and the world about me. Professional sports is full of many and varied personalities that meld in a myriad of different ways. Some relationships are purely on-field whilst others are as suggested life long. My approach to friendship throughout my career was to always have a key group of friends (M/F) who didn't see my person as that of a footballer/athlete. I have a number of very good friends from various teams and sports that I have met or played with through my time in football - some are once a week associations-others per month etc. I think that once you leave your sport and forge a life beyond the playing surface, much like school days, relationships tend to wind down. There is however a bond that unites athletes who have played together or experienced elite level sports that is ongoing. Watching Carlton over recent years, I noticed on many occasions us playing a defence that was easily out muscled and outsized by the opposition forwards. In particular a game against Collingwood about two years ago when we were up my enough at half time and got overpowered in the second half. Defence in any sport is a difficult proposition and few players really commit 100% to the task. Everyone likes to have the ball/bat in their hand with the chance to score. AFL football provides one of the harder defensive tasks with large open space-multiple options-quick and unpredictable movement-rules geared towards forwards and 360 degree game play. When playing on a taller opponent a defender has little choice but to play side by side or slightly to the rear of a prefered hip and rely in part upon his teammate placing pressure on incoming ball movement. As you have suggested Barnsey a moving spoil 'is' the best form of attack BUT given rules changes and the art of the spoil itself (which takes great timing) most players would choose to simply win a 50/50. Some food for thought might include why didn't any other player/s assist?-what pressure was placed upon the kicker?-had the defender been operating at equal too or better than 50%?-what were the coaches instructions? Not playing AFL football does not preclude anyone from coaching the sport but not having played professional sport in general, I believe, makes it much harder for a coach to empathize with his/her players or direct individuals.Wayne Brittan fell at the first hurdle due to extreme injuries across his list (that no coach could have masked) and via a hastened development which placed him in the hot seat ahead of time (1 or 2 seasons). The general rule appears to be to rush towards the role of head coach but that position may not suit the attributes of an individual as much as an assistant or skills coaching position. I would suggest that most AFL players be they current or retired still maintain a passion for the team they supported as a child/young adult.Whilst seasoned players develop a bond with the club (or clubs) they played for there is little doubt old allegiances still remain. Unfortunately the wider community forgets that ultimately they decide what the media do or don't run with as copy or topic across any of their varied mediums. Whilst there is an appetite for seemingly random and shallow insights into players lives the media will serve such a dish. A simple rule may be to be proactive and demand more of your dollar and the time you invest in reading the paper; raise the bar or in the case of some journalists create a bar. All is not lost at this point but should your dog fail the following test it may be time to buy a cat. Your dog is not a Collingwood supporter if it chases its tail, howls wildly and takes two shots of your finest whiskey everytime *Mick Malthouse speaks. Clearly the animal is in distress and not a Collingwood supporter. (*) Rememeber that cruelty to animals is not acceptable. Dogs have acute hearing and as such are easily distressed by monotonous drones. Page last modified on Monday 07 of April, 2008 23:33:19 AEST by Jarusa. 1984 Rd 14 - Fraser Murphy about to give off handball.